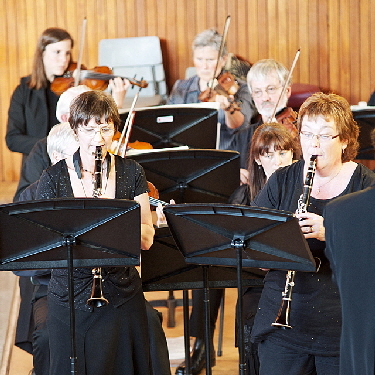 The Colinton Amateur Orchestral Society to give the orchestra its proper title, began life as the Juniper Green Amateur Orchestral Society which was founded in 1928. We have a concert programme from 1930 but no records are available after this date until 1952. By 1953, the orchestra was operating as an evening class under the auspices of the Edinburgh Education Committee and in the autumn of 1958, the name was changed to the Colinton, Juniper Green and District Amateur Orchestral Society. In 1969, the Education Department withdrew its funding and the orchestra became self-funding through income from member’s subscriptions and concerts. In 1978 the orchestra became known under its present title of Colinton Amateur Orchestral Society and moved to St Cuthbert’s Church Hall in Westgarth Avenue. By 2019, membership had grown to around 50 players making the hall at St Cuthbert’s too small for our needs. In February we moved to the assembly hall in Firhill High School which provides us with the space that we need to rehearse comfortably.